The above combination gives Holt Mitsubishi Enterprise level connectivity and internet gateway protection. Holt are now able to use the leased line for all Internet, DMS and VoIP connectivity negating the need for separate connections. This setup is actually saving Holt Mitsubishi money whilst returning an Enterprise class setup. Shiloh Computers dealt directly with the leased line providers ensuring the routing of the cabling is tidy and agreeable with the M.D. 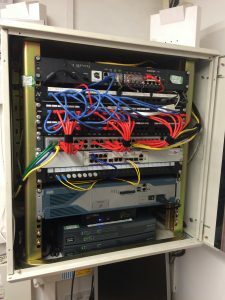 Once this was installed we visited site and installed the managed Cisco router and mated this to our configured SonicWALL router. After confirming all router settings were in-place and contacting the DMS provider to ensure that their router was also reconfigured to the new connection, we switched over to the new leased line. Holt immediately noticed not only the increased speed but the responsiveness of the connection. All other services were then switched over including email delivery. As Holt Mitsubishi already have Email Spam Filtering through Shiloh Computers, there was no delay in email delivery as we did not need to wait for MX records to update, we simply updated the destination IP where mail is delivered. The Leased Line is monitored 24/7 with our support desk being notified of any issues. We get both Text and Email alerts if there is any issues or downtime. Need a boost in your internet connectivity??? Why Not Call Us Today to discover how Shiloh can help YOU on 01902 504710? Previous: Previous post: Don’t Just Get A Firewall! !